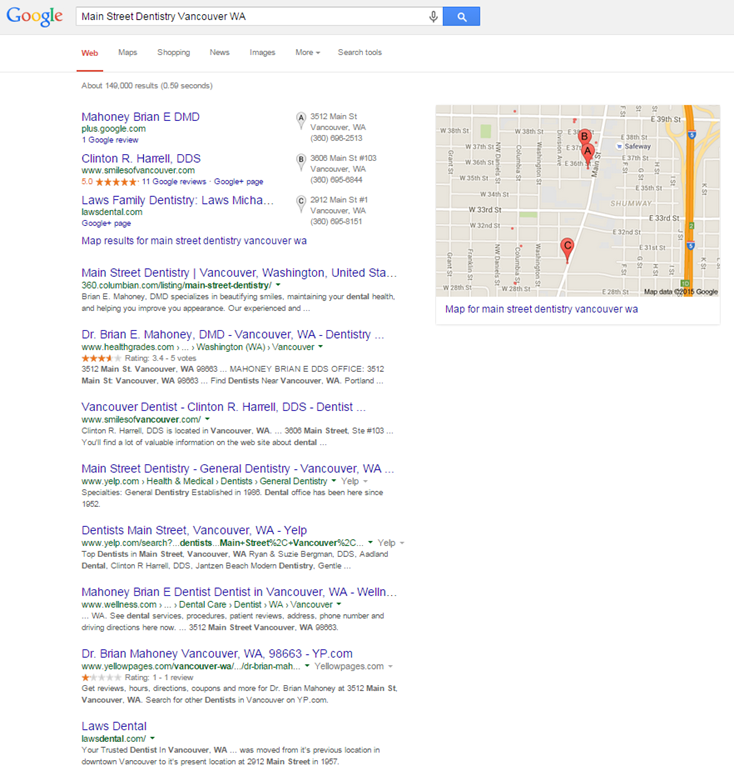 For brick and mortar businesses, Local SEO is a crucial part of increasing local visibility in search. Local SEO, like traditional SEO is a long-term play and takes time to see significant results, but there are certainly several things businesses can do to see immediate movement in search rankings. Improving search rankings right off the bat can truly be as simple as claiming and verifying your local business listing on Google My Business. Google My Business (the business side of Google+) sends an initial, strong signal to Google that your business and your site are worthy of rankings. 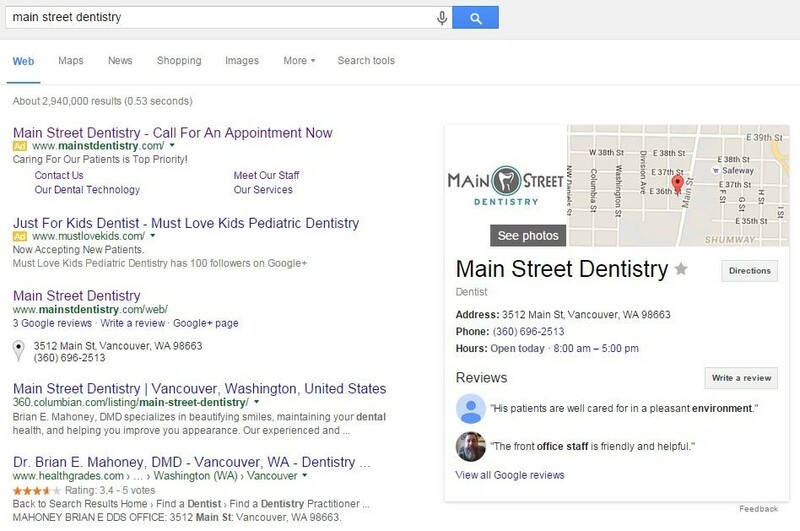 For example, Anvil’s client, Main Street Dentistry’s website was completely absent from the first page of search results even for its own name! However, by simply claiming and verifying its local listing on Google My Business, they now appear first in search for its name and have a knowledge graph with its address, phone number, reviews and photos of the business (see below). This is an incredibly easy and powerful way to improve local visibility as 4 in 5 consumers use search engines to find local information (according to Google). While the majority of searches take place on Google, it is also a good idea for businesses to claim and optimize their listings on Yahoo and Bing, as you want to be visible anywhere a potential customer would be looking for your services. Including your website, address, phone number, hours of operation and photos of your business and/or services will also help to strengthen your local visibility on these platforms. Besides claiming your local search listing, creating and claiming your listings/profiles on Yelp and Facebook will significantly improve your visibility in local and branded search. Creating these listings and profiles is simple, fast and will create additional avenues through which potential customers can find your business. There are certainly many more tactics that local businesses should take when working to improve their Local SEO, but claiming your Google My Business, Yahoo, Bing, Yelp and Facebook listings will give you a big initial boost to visibility and create a stronger foundation to build on as you begin the longer term strategies necessary in seeing even greater local search improvements.